Flying Gluten Free with South African Airways. Flying gluten free can be a hit and miss experience, often more miss than hit. However I recently flew gluten free with South African Airways ("SAA") and enjoyed really good gluten free airline food with excellent service. I flew economy, taking two international flights (to and from the UK) and two internal flights within South Africa. SAA were informed before I flew that I required gluten free food but I did no other checking or reminding before I flew. For those who like detail I have listed later in this article exactly what I received together with some photos. Overall I would rate my gluten free experience with SAA as excellent. With a couple of exceptions relating to individual food items I would rate both food and service as 5 out of 5. I would particularly highlight their service on all the flights I took. I never had to ask any of the cabin crew about my food and didn't have to make myself known to them. The staff simply brought my meals on all flights without any fuss and without making me feel "different". The food item exceptions were not SAA's fault as these related to the fact that most gluten free bread rolls are dry (as theirs were) and rice cakes get a bit soggy when used for a sandwich. This latter issue did nothing to stop me enjoying what was a very tasty salmon and cheese sandwich. 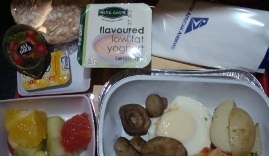 On the two international flights I took I received dinner and breakfast. On the two internal flights within South Africa I received a snack. The starters on the two flights I took were different. On the UK to South Africa flight I had fresh peppers, corn and salad. This had good flavour and texture. From South Africa to UK I was given a cold roast vegetable salad with peppers. The peppers gave it a nice kick I hadn't expected although I wasn't so keen on the vegetables being cold. 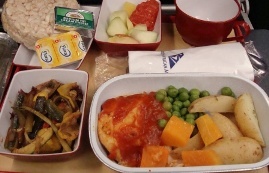 On both flights the hot main course comprised chicken with tomato sauce, new potatoes and vegetables. The vegetables were peas and carrots on one flight and broccoli and carrots on the other. In both cases the chicken was excellent. The meat itself was moist with good flavour and there was enough sauce to add extra taste and a slight spice. Vegetables were a good mix of flavours. On both flights dessert comprised two aspects – cheese and fruit salad. Out of the UK I received a gluten free roll, butter and cheddar cheese. The cheddar was good but unfortunately the roll was very dry and crumbly. Gluten free rolls are usually poor and this one was no exception. The fruit salad was fresh with good flavour and comprised mango, pineapple, melon and apple. Out of South Africa I received onion and chive cream cheese with rice cakes which I enjoyed more than the gluten free roll. The fruit salad was again fresh with good flavour and a nice mix of pink grapefruit, apple and pineapple. On the flight out of the UK, breakfast included two small dishes of the same fresh fruit as had been the dessert at dinner. This was fine quality wise but lacked imagination. The hot breakfast comprised bacon, tomato, spinach and mushroom. This had good texture and flavour. There was also a gluten free roll with butter and strawberry jam. This suffered from the same quality issues as the dinner due to the quality of the roll. On the flight out of South Africa, breakfast included a fresh fruit salad of grapefruit and apple. This was served with a pot of sweetened low fat fruit yogurt. This was more imaginative than the flight out of the UK. The hot element comprised poached egg, mushrooms, smoked salmon and new potatoes. Although this looked dry it wasn’t. It was a good mix of flavours and tasted nice. However I would have liked it a bit hotter (in temperature), it was a bit lukewarm for my taste. The final element was a rice cake with butter and jam. On the afternoon flight I received an open rice cake sandwich, one half with sliced cold chicken and cucumber, the other half with cheese and tomato. The quality of the chicken was excellent, moist with good flavour. The cheese had good flavour and texture. I also received a small packet of dried fruit which was a nice sweet finish to the snack. Overall this was a tasty, satisfying and healthy snack. On the morning internal flight the snack was a rice cake sandwich of smoked salmon and two types of cheese. This had lots of flavour and looked good. I really enjoyed it although the rice cakes had gone slightly soggy. For more reviews and the latest gluten free news, sign up to our newsletter in the top right hand corner of this page.